This weekend it's the Dubai World Cup, the most glamorous weekend in our social calendar. It's time to dress up and bring out that favourite dress, experiment with a hat and try spending a day walking around in the highest of heels. 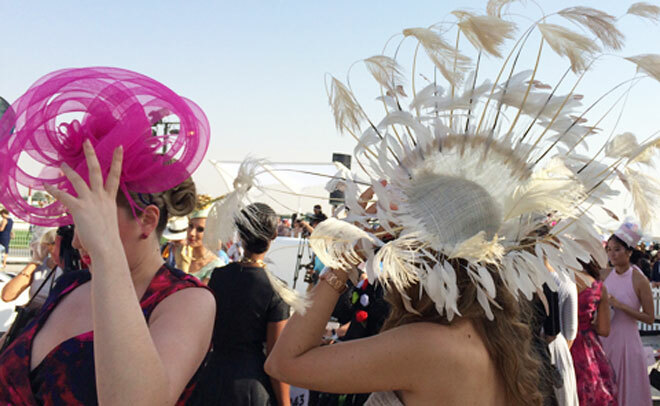 The gents and ladies are expected to come out in force in an array of outrageous hats and stylish ensembles in the world's richest horse race at Meydan. Few events can compete with the scenery and excitement that the Dubai Racing Club offers at the Meydan Racecourse as 12 horses participate for the US$10 million (Dh36.7m) main event. Fashion here has become an institution in itself, with many hoping to win the off-track competitions including best dressed lady and man, best dressed couple, best hat, most creative hat and Longines most elegant lady. The stakes are equally high and the competition fierce. The Jaguar Style Stakes will celebrate the most stylish and creative men and women, all competing to drive away in the star prize, a Jaguar F-Type. Other prizes will include watches from Longines, cash prizes, pamper packages, hotel stays and many more. The judging panel brings expert from Fashion industry like Alanoud Badr, founder and designer of Lady Fozaza who will be joined by Melbourne based milliner Kim Fletcher. Also in the judging panel is Kate Hazell who is a British fashion director, journalist, stylist and writer. Salman Sultan will join the group and his core area of focus is to manage the PR, Social Media and Events programmes across the region.